Hi, this year we have a slew of some tall plants that are growing. They are 6' tall, at least, and the leaf is shown on the attached picture. It doesn't seem to be flowering, or look like it's going to. They started coming up about a month ago, and first we thought they were leftover crackerjack marigolds. This is the first year it's shown up, but then the winter and weather has been very different. A lot has been cut down because whatever it is, it's very invasive! We've looked online to try to find pictures, descriptions, anything that can tell us what this is. Can you help with this? Thanks!! 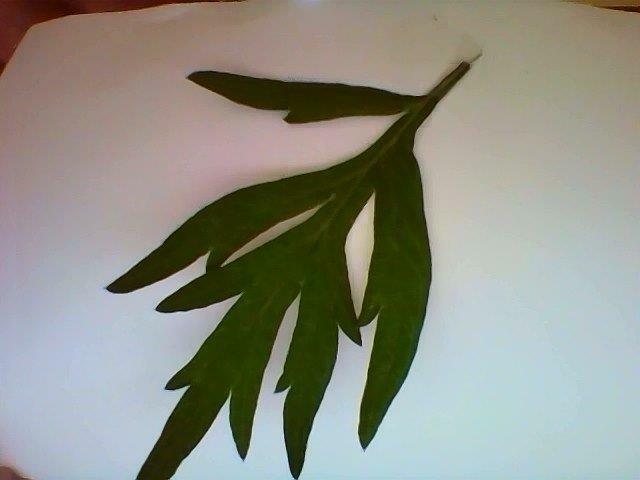 It is difficult to identify the weed from a picture of a leaf. It looks to me like mugwort (Artemisia vulgaris). To get accurate identification I suggest you send a sample to the UMass Extension Plant Diagnostic Lab (There is a fee for this service.) Collect a whole plant. Place plant in a zip-lock or freezer bag and seal with some air in the bag in order to prevent crushing. Fill out the weed diagnostic form as completely as possible. Place bag in a sturdy box or envelope and mail to the Lab together with form. Here is the link for the Lab’s weed identification form.